Combine water, orange juice and sugar in a medium saucepan. Over medium heat, bring to a boil, stirring often. Add apples, cranberries, cinnamon, ginger, cloves, and cayenne pepper (raisins, too, if you're adding them). Bring mixture to a boil, then turn down the heat and simmer for about 10 minutes, stirring frequently. Pour chutney into a bowl and let it cool to room temperature before serving (mix before serving) or cover and store in the refrigerator. If storing in the refrigerator, bring the chutney to room temperature before serving it. 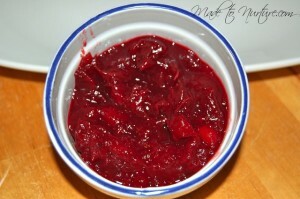 This entry was posted in Recipes and tagged chutney, cranapple orange, cranberry apple orange chutney, recipes, sauces.